While Georgia goes for questionable biomass, WCTV reports that CFO Sink Applauds Opening Of Solar Energy Center, Welcomes $200 million in federal funding for Florida. Florida CFO Alex Sink welcomed the news that a $200 million grant will go to Energy Smart Florida for the installation of 2.6 million smart meters in homes and the installation of advanced monitoring systems in grid substations. “Florida has been known as the sunshine state because of our beaches, but today we are taking an important step forward in becoming known as the sunshine state because of our commitment to solar and alternative energy. I commend Florida Power & Light for opening the nation’s largest solar photovoltaic plant here in Southwest Florida, and welcome President Obama to our state to see firsthand how we are working to diversify and modernize Florida’s economy. South Georgia has just as much sunshine as north Florida. And you can build solar equipment anywhere. For example in a county with I-75 running through it and I-10 nearby. Maybe if Atlanta won't lead, Valdosta should. 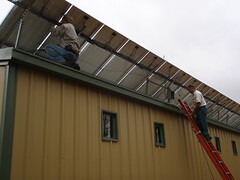 Although no solar panels have been installed in Colquitt County yet, Park said they and other green power sources are gaining popularity in Georgia. Solar panels have been installed by EMCs across the state , and EMC is looking to more ways to make use of otherwise wasted materials. Well, maybe not in Colquitt County, but Colquitt EMC has a grid tie to a solar installation in Lowndes County. PS: The Moultrie Observer has the most annoying online ad on that page that I've run into in a long time. 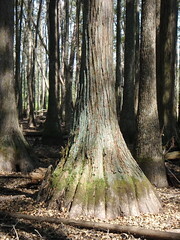 Videos by Gretchen Quarterman for the Lowndes Area Knowledge Exchange (LAKE). More are still uploading. All the local candidate videos that LAKE took on 5 Oct 2009 are now in the playlist, as of 10PM 25 Oct 2009. Videos taken at the 15 Sep 2009 political forum are already online. 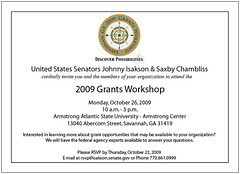 Both Georgia Senators are holding a workshop in Savannah Monday October 26th about federal grants. To attend, you must register today, October 22nd. I called Isakson's office, and the woman who answered the phone said they hold one of these a year. Last year it was in Atlanta, next year she thinks probably Macon. So this year this is the only one. Hm, I wonder how much of this is stimulus money that these two senators voted against? The new development regulations were proposed in light of plans for the Gateway to Hahira project, which include a Harveys Supermarket. While the developer for the project has promised that its design will match the integrity of the small town, downtown atmosphere, there are no regulatory provisions in place to ensure this. Or they could just trust the developers of a project bigger than downtown Hahira that it will preserve the Mayberry character of Hahira. 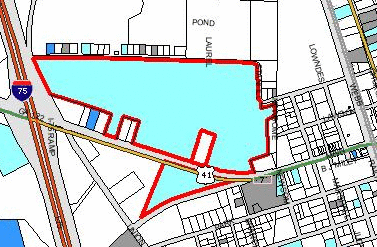 The Lowndes County Real Estate database shows that Hahira Gateway LLC owns much more land north of 122 than it does in the angle south of 122. 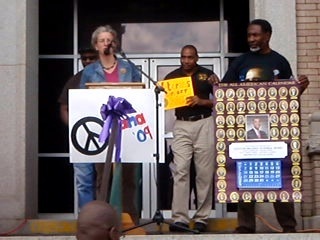 More than fifty people listened in a cold wind Saturday to a dozen speakers on the courthouse steps saying "I support president Obama". Speakers included Gretchen Quarterman (MC), Tony Daniels, Marcus Rhone, Ruth Council, Mrs. Annie Fisher (on the Valdosta School Board), Gladys Lee (from Brooks County), Betty Marini (from Lanier County), Jim Parker, RJ Hadley (from Rockdale County, running for U.S. Senate against Johnny Isakson), Freeman Rivers, Lee Touchton, Gale Eger, John S. Quarterman, and others whose names I didn't get. Bailey said it’s important that any policies implemented utilize proven and effective technologies, and he warned that the price for doing nothing could be high. Story by Matt Flumerfelt in the VDT, 15 Oct 2009. The closer you live to nature, the healthier you're likely to be. "It's nice to see that it shows that, that the closer humans are to the natural environment, that seems to have a healthy influence," said Dr. David Rakel, director of integrative medicine and assistant professor of family medicine at the University of Wisconsin School of Medicine and Public Health. USDA is offering to help people use federal money for energy efficiency and renewable energy. Their flyer is a PDF. I have transcribed it below. 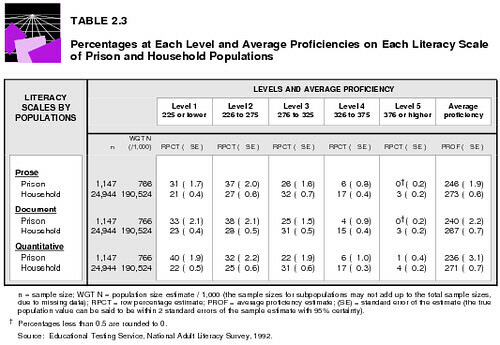 There's a widespread factoid claiming that multiple states (maybe California, Arizona, Indiana, or Virginia) decide how many prison cells to build according to second or third grade reading levels. This is an urban legend, debunked by Washington Post, DailyKos, and numerous other investigators. Lots of people have requoted this factoid, from Colin Powell to Hillary Clinton, but they were misled. However, there is substantial evidence that low educational performance does increase likelihood of incarceration. Furthermore, parental involvement won't be enough to deal with this, since low-education prisoners tend to have low-education parents. Hillary was right: it does take a village.